The N.C. Chronicles. : Toronto big red under scrutiny for her stfu expressions, defended by feminist sites. Toronto big red under scrutiny for her stfu expressions, defended by feminist sites. I looked it up and yes, radical feminists sites are saying red is scared because she has been threatened for....saying shut the fu... up to men...and if she has been threatened then I and others will not accept this behavior, debate is what we want, not feminist policies of a one sided argument without opposing views. I don't put up links because I do not want to give radical male hating feminists sites the credit. First, it is possible, there are individuals who are nasty out there, "of both gender". But what I noticed about these fem pages is they blame men's sites. Well maybe she should not of tried to be so accessible to the youtube generation, she is after all, all over the place. But that's her free choice. Second, let's not forget, a lot of feminists will open sites, emails so on, pass themselves out to be men and say the nastiest of comments to blame the male population as a whole. Third, these fem sites keep on referring men are mad because she only tells males to shut the fu.. up...as if she a big hero...wrong again. 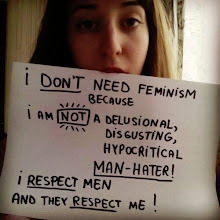 She has the right to her opinion, without fear of repercussions, we all defend that right, but if she keeps on been arrogant with her opinions without accepting opposing views, then she is not going to be taken seriously and will be posted all over the place as a typical feminist clown. She is a typical feminist clown.